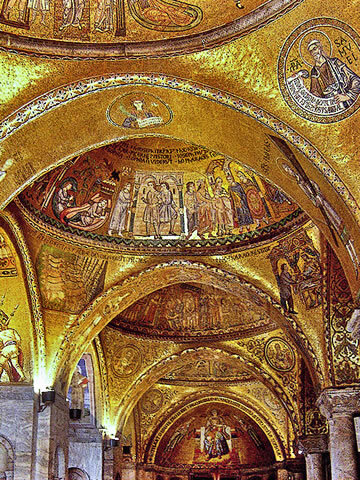 Let's just come out and say it: there simply is no church in Europe more lavishly decorated, more exquisitely mosaicked, more glittering with gold than San Marco, the cathedral of Venice. Built in the 11th century, St. Mark's guiding principle in architecture and decoration is Byzantine, but Romanesque and Gothic styles have left their mark as well over six centuries of expansion and decoration. The atrium, ceilings, walls, and multiple domes are all encrusted with over 40,000 square feet of gold-backed mosaics crafted between the 12th and 17th centuries. The oldest of these mosaics were created by Eastern masters, and later ones were based on cartoons by Tintoretto, Veronese, and Titian. 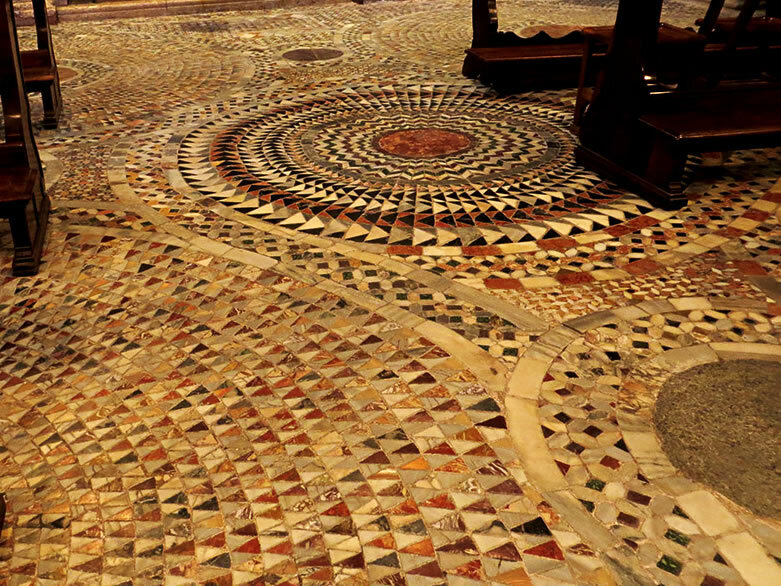 The floor is a reflection of the mosaic craft in marble, an undulating wonderland of color and pattern. The church's most disappointing aspect is that it's so popular and its lines so long you are shuffled through like sightseeing cattle, kept moving along so the next batch of tourists can cram in. Still, your time inside will be unforgettable. 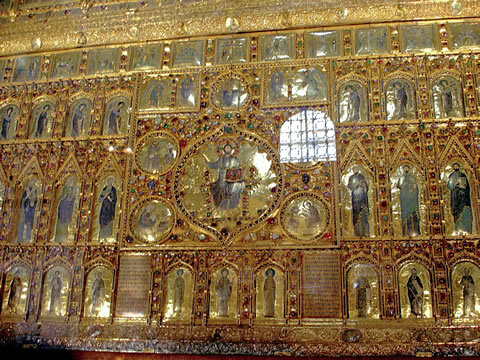 The golden Pala d'Oro altar in St. Mark's Cathedral in Venice. Don't miss popping into the baptistery alcove (adm), with a font carved by Sansovino, or checking out the presbytery (space behind the main altar) with its Pala d'Oro, a gem-studded golden trophy altar from Constantinople (adm). Above the church proper and entered through the atrium is the Marciano Museum (a.k.a. Loggia dei Cavalli, the Loggia of the Horses), which gets you up onto a balcony and affords you a close-up look at some of those mosaics. It also houses the original Triumphal Quadriga of four horses, replicas of which stride across the facade's roof. 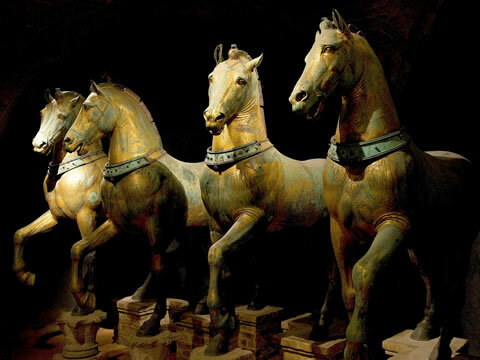 These life-size bronze equines are one of Venice's treasures. Taken in 1204 from Constantinople during the crusades, their origin is murky, but they're at least ancient (AD 2nd century is the best guess), either Roman or Hellenistic. Free summer tours: The cathedral runs free guided tours from April to October, usually around 11am Mon-Sat, which include a Biblical reading of some of the mosaics. Check signs posted in the atrium for specifics, or call tel. +39-041-241-3817 (sometimes they will add a tour simply if you call to request one). How long does St. Mark's take? Dress appropriately—no bare shoulders or knees (i.e. no shorts, short skirts, or tank tops). Keep respectfully silent (this is, after all, a church). This brings a disappointed groan out of everyone, but positively no photography is permitted. I know. It makes me angry, too. Large bags are no longer allowed inside the basilica, and a free left luggage office has been established at Ateneo San Basso in Calle San Basso 315A on Piazzetta dei Leoni (to the left of the church facade). Oddly (and terribly inconveniently), the bag drop opens after the basilica and closes early: Mon-Sat 10am–4:30pm, Sun 10am–4pm. 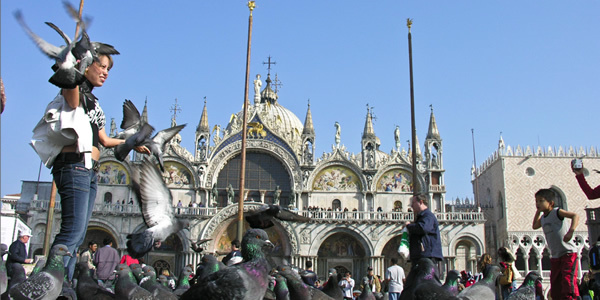 My favorite time to visit St. Mark's? On Sunday for the 6:45pm—for mass. Mass? Yep. While the priest drones in singsong Latin at the altar, incense swirling around him from a swaying censor, you can sit in silence for an hour getting a crick in your neck. Only one rule: Tourists are not allowed, so you must be discreet, arrive on time, stay in your pew, and sit quietly through to the end. Even if you are not devout (or not a Christian), this counts as a bona fide Italian cultural experience. Though the lights are not switched on, regular masses are also held Mon-Sat at 7am, 8am, 9am, 10am, 11am, noon (except July-Aug), and 6:45pm, and Sunday at 7am, 8am, 9am, 10:30am, noon, 5:30pm (Vespers), and—the best, with illumination—6:45pm. Why is it called St. Mark's?